Vanilla beans are an expensive commodity, and can wholesale for between $65 and $200 per pound, depending on quality and country of origin. Each vanilla bean takes about one year to come to market, and along the way requires much labor, from hand pollinating to hand picking, fermenting and bundling. 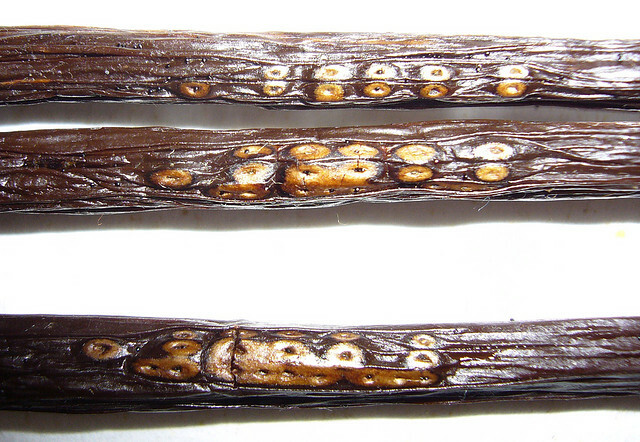 As a valuable but portable commodity, vanilla beans are at risk of being stolen from the farmers who grow them. Like cattle ranchers, vanilla bean growers “brand” their beans. Usually referred to as a “tattoo,” a distinct pattern is made on the vanilla bean pod while still green. After the bean is dried and fermented, the tattoo looks like a scar, and could be mistaken for insect damage. However, each farmer uses a distinct pattern which can be used to identify their product if it is stolen and mixed with another crop.